Posted on April 13, 2017 by Courtney Duerig / This entry was posted in Garden Center Advice, Pottery and tagged care, chimenea, fire pits, instructions, mexican chimenea, setup. Bookmark the permalink. Here’s what to keep in mind as you set up your new Chimenea. Location: Position the Chimenea outdoors, clear of roots, debris and trees. If you are placing the Chimenea on a wood deck, its best to set it on top of bricks or flagstone. Preparation: Before lighting a fire, place 3 to 4 inches of lava rock or gravel inside the base of Chimenea to raise fire off clay bottom. Building a Fire: Always warm up a Chimenea slowly – First build a small fire, allowing Chimenea to heat up for at least 20 minutes to avoid cracking. Then you can add more logs for a larger fire. Maintenance: Do not use your Chimenea if it is wet. 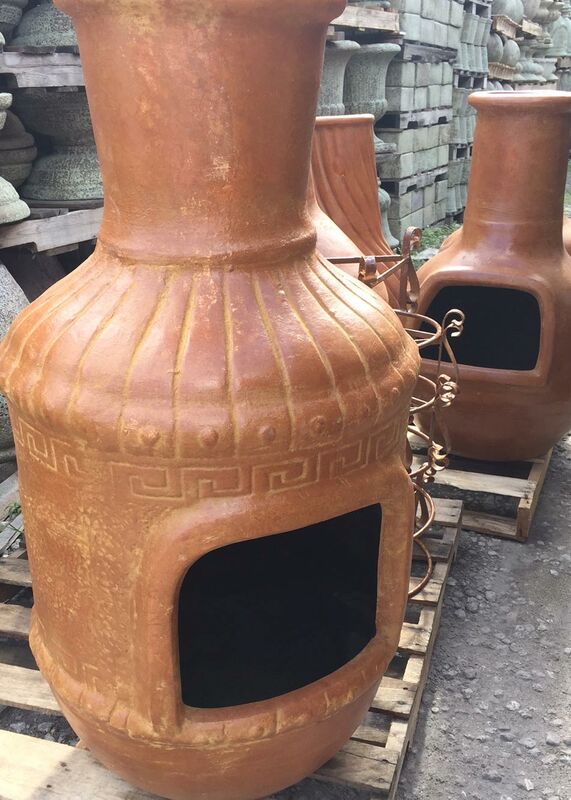 Remeber in the winter, Chimeneas are not frost proof. If your Chimenea is wet in freezing temperatures, it can crack. Do not light a fire in your Chimeneas when the outside temperature is below 35 degree Fahrenheit. You can repair a crack in your Chimenea by applying a silicone sealant to both sides of the crack. Let it stand for 24 hours before using again. After it rains, a natural white alkaline may appear on the pot. To clean, gently scrub the surface with vinegar and a nylon brush, and rinse after the alkaline has dissolved. To prevent rainwater from collecting inside and to protect your Chimnea from the sun, which could cause peeling of the surface, cover the Chimenea with a tarp, or you can purchase our Waterproof Chimenea Cover “CH716”. Safety: The Chimenea will radiate heat, so make sure to keep children at a safe distance and never touch the Chimenea while the fire is lit. Don’t leave your Chimenea unattended while in use. When finished, make sure to completely extinguish the fire, especially if it is on wood deck.